Did you know that the worlds most valuable photo company actually sells no camera, the worlds largest taxi company owns no vehicles or even the worlds largest growing television network lays no cables? If you haven’t guessed already I’m talking about Instagram, Uber and Netflix all these companies started small but completely transformed their chosen industry but thinking outside of the box. Facebook took a mare 3.5 years to acquire 50 million customers, Whatsapp took 15 months, Angry Birds took just 15 days. Experts have predicted that by 2025 over 2 billion people will have their first banking experience on their smart phone. 80% of these people will never walk in a bank branch. 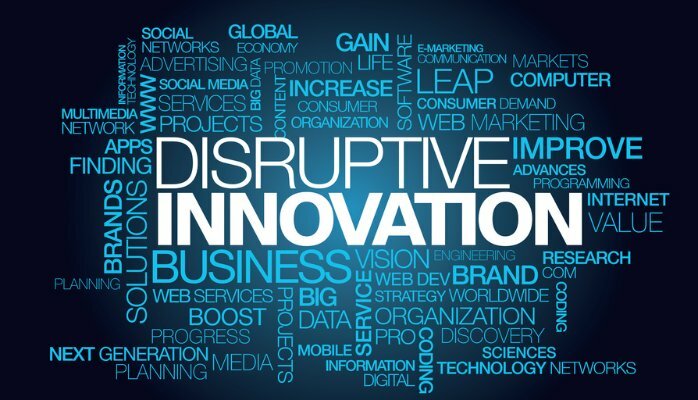 Disruptive technology is one which displaces an already established technology and shakes up the entire industry, it can also be a ground-breaking product which helps to create a completely new industry such as Facebook with social media. Harvard Business School professor Clayton M. Christensen separated new technology into two such categories: sustaining and disruptive. Sustaining technology relies heavily on incremental improvements to an already established technology. Disruptive technology would often lack refinement, will have performance problems because it is new and appeals to a limited audience as it may not yet have a proven practical application, this was the case with Alexander Graham Bell’s and his “electrical speech machine,” which is better known in the modern world as a telephone. How does a small young company overcome the industry giant? Well when the larger company start focusing on sustaining innovation by upgrading existing products and services in order to attract higher paying customers, the problems start to occur when they start to ignore all such customers who want simple low-cost alternatives. This is where a small entrepreneur company jumps in with that basic offering, while the larger company focuses on their more profitable customers by adding unnecessary features that no one wants to pay for. Meanwhile, the disrupter focuses on improving its current product in order to appeal to more customers and by the time the larger company starts to notice the disrupter has already taken over the market. Blockbusters were dominating in the movie world, selling CD’s and DVD’s but failed to cooperate with the changing world, Netflix explicated the gap in the market and excelled beside why will you pay £5 to borrow a movie from Blockbusters when Netflix gives u thousands of option for the same price and all from the comfort of your own home.